Runs AC and DC appliances. Fast charging of batteries from solar. Battery charging commences at 110VoIt. Pure sine wave UPS with 85% efficiencyff. iSOT: Intelligent solar optimization technique. Protects battery from over charge for longer life. 25-30% savings on electricity bill, Reduced charging time. Very safe for sensitive products like TV, PC,laptops & Refrigerators. 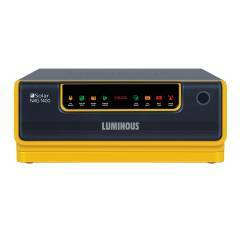 Luminous NXG 1400 1100VA Sine Wave Solar Inverter is a premium quality Solar Inverter from Luminous. Moglix is a well-known ecommerce platform for qualitative range of Solar Inverter. All Luminous NXG 1400 1100VA Sine Wave Solar Inverter are manufactured by using quality assured material and advanced techniques, which make them up to the standard in this highly challenging field. The materials utilized to manufacture Luminous NXG 1400 1100VA Sine Wave Solar Inverter, are sourced from the most reliable and official Solar Inverter vendors, chosen after performing detailed market surveys. Thus, Luminous products are widely acknowledged in the market for their high quality. We are dedicatedly involved in providing an excellent quality array of Luminous Solar Inverter.